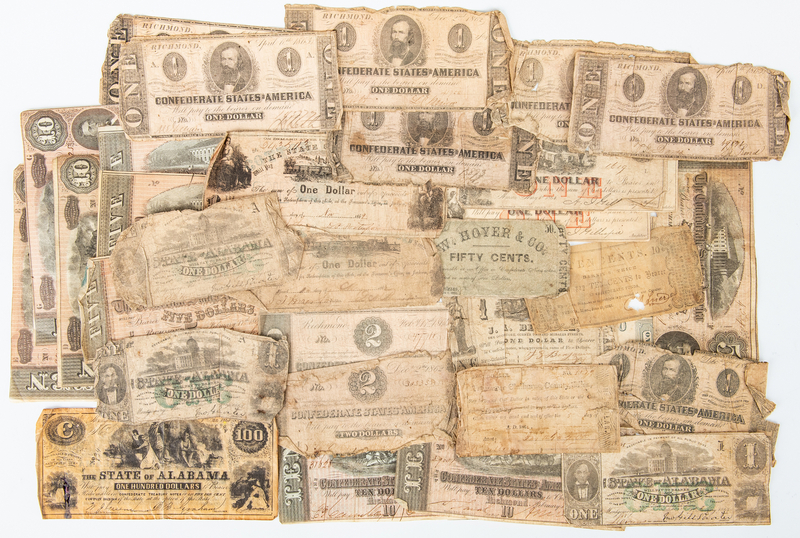 Group of thirty-two (32) Confederate States of America (CSA) bills. 1st item: One (1) CSA State of Alabama $100 bill, issued in Montgomery, AL, dated January 4, 1864. 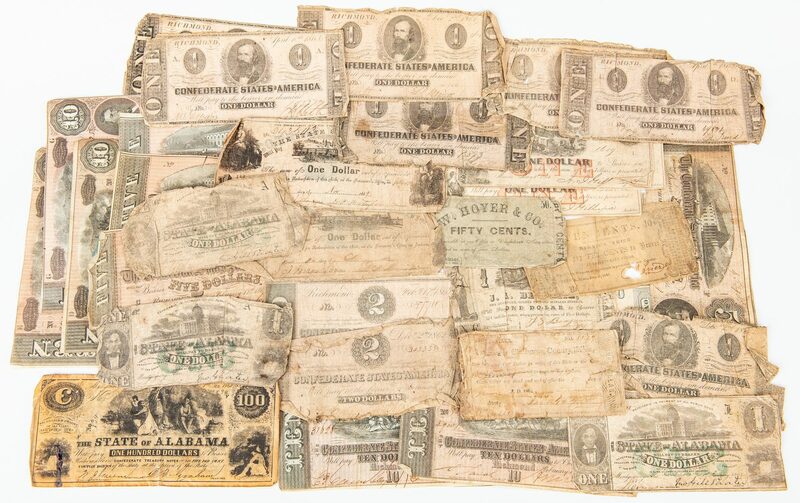 Serial # 834/ pp F. 2nd-6th items: Five (5) CSA $10 bills, issued in Richmond, VA, dated February 17, 1864. Serial # 8623/ pp D, 3rd series; Serial # 29031/ pp C, 6th series; Serial # 5025/ pp G, 7th series; Serial # 8301/ pp E, 7th series; Serial # 31628/ pp B, 8th series. Signatures "for Registrar" and "for Treasurer". 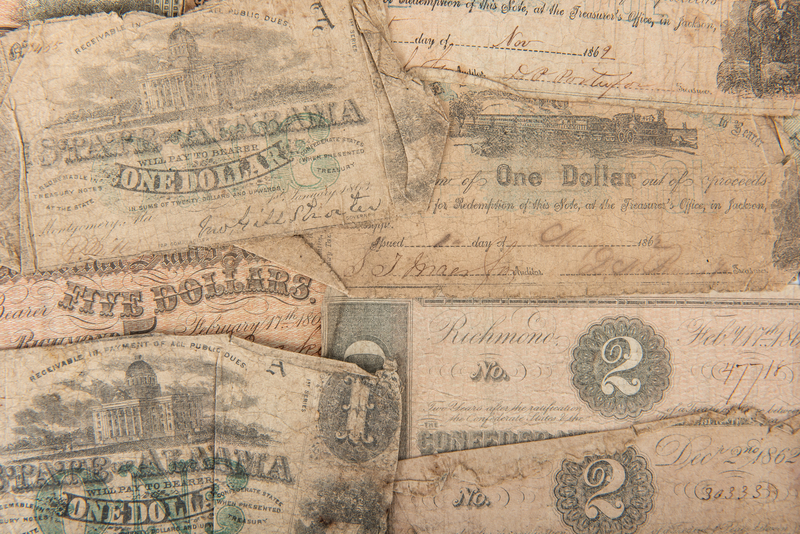 7th-10th items: Four (4) CSA $5 bills, issued in Richmond, VA, dated February 17, 1864. Serial # 45340/ pp F, 3rd series; Serial # 52960/ pp D, 5th series; Serial # 55610/ pp G, 5th series; Serial # 55009/ pp C, 6th series. 11th-12th items: Two (2) CSA $2 bills, issued in Richmond, VA, dated December 2, 1862, Serial # 30333/ pp I, 1st series, and February 17, 1864, Serial # 47718/ pp C. Signatures "for Registrar" and "for Treasurer". 13th-19th items: Seven (7) CSA $1 bills, issued in Richmond, VA, dated December 2, 1862, Serial # 29808/ pp F; Serial # 41922/ pp A, and April 6, 1863, Serial # 49891/ pp D, 1st series; Serial # 94442/ pp A, 1st series; Serial # 143379/ pp A, 1st series; Serial # 13899/ pp F, 2nd series; Serial # 98703/ pp B, 2nd series. Signatures "for Registrar" and "for Treasurer". 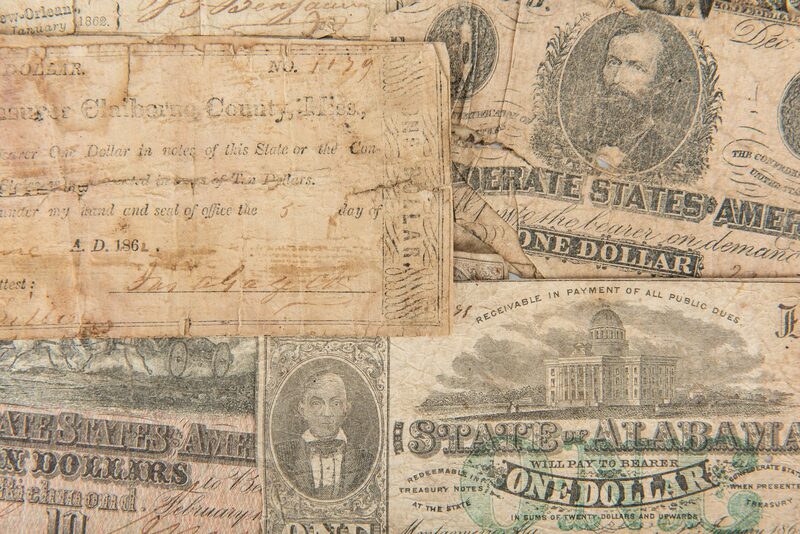 20th-22nd items: Two (3) CSA State of Alabama $1 bills, issued in Montgomery, AL, dated January 1, 1863, 1st series. Serial # 3455/ pp A; Serial # 55298/ pp I; one with no serial number/ pp A. Signed by Governor John Gill Shorter and "For Controller". 23rd-24th items: Two (2) CSA State of Mississippi $1 bills, issued in Jackson, MS, dated May 1, 1862, Serial #140361, and November 1, 1862, Serial # 243503. Signatures "for Auditor" and "for Treasurer". 25th-27th items: Three (3) CSA State of Mississippi $1 bills, issued in Macon, MS, dated May 1, 1864. Serial # 1619/ pp L; Serial # 9590/ pp B; Serial # 9591/ pp C. Signed by A. J. Gillespie, State Auditor of Mississippi from 1862 to 1865. 28th item: One (1) CSA J. A. Benjamin $1 bill, issued in New Orleans, LA, dated January 20, 1862. Serial # 162B/ pp A. Signed by J. A. Benjamin. 29th item: One (1) CSA A. de Monasterio $1 bill, issued in New Orleans, LA, dated 1862. Serial # 902. No signatures present. 30th item: One (1) CSA bill, issued by Claiborne County, MS, dated June 5, 1862. Serial # 1179. Signed by the county treasurer with "attest" signature. 31st item: One (1) CSA Barney's Trice 10 cent fractional note, issued in Verona, MS, dated June 10, 1862. Illegible signature. 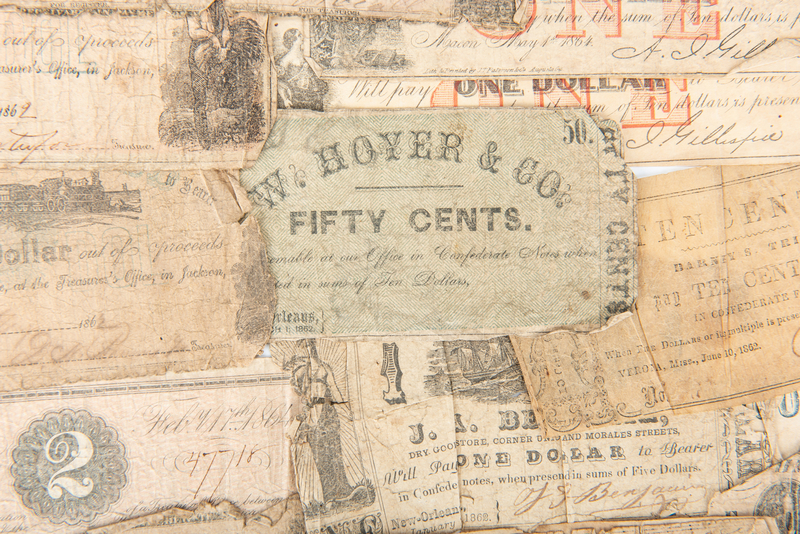 32nd item: One (1) CSA W. Hoyer and Company 50 cent fractional note, issued in New Orleans, LA, dated March 1, 1862. Illegible serial number and signatures. CONDITION: Overall good condition with tears, areas of loss, fading, etc. to be expected from age and manner of use. 1st item: 1 1/4" stain with mylar residue, lower left of bill. 13th-19th items: 3" x 2 light blue paper backing to $1 bill serial # 49891. 29th item: Signatures torn away, lower section of de Monasterio bill. 30th item: Claiborne County bill backed by fragment of unspecified June 1861 almanac. 31st item: 1/2" x 1/2" tear obscuring signature.